When life gives you lemons, make a quilt. In progress: basting. At this point I finally knew what the quilt looked like all together! I used her favorite color of all: green. 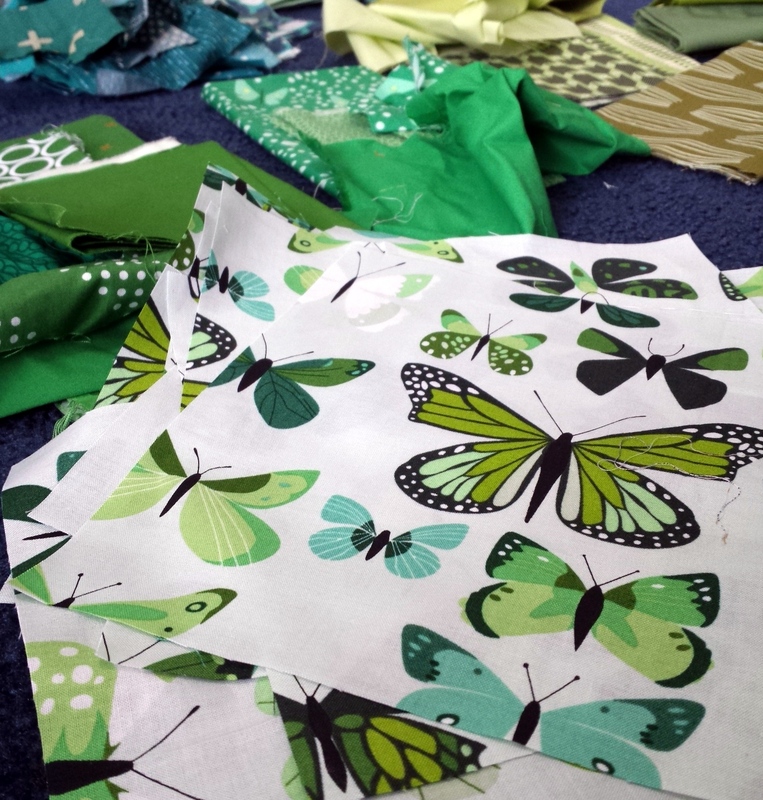 I started out by staring at Lizzy House's butterfly print (Butterfly Box in Green), and since it has ALL THE GREENS, it became the focal print. 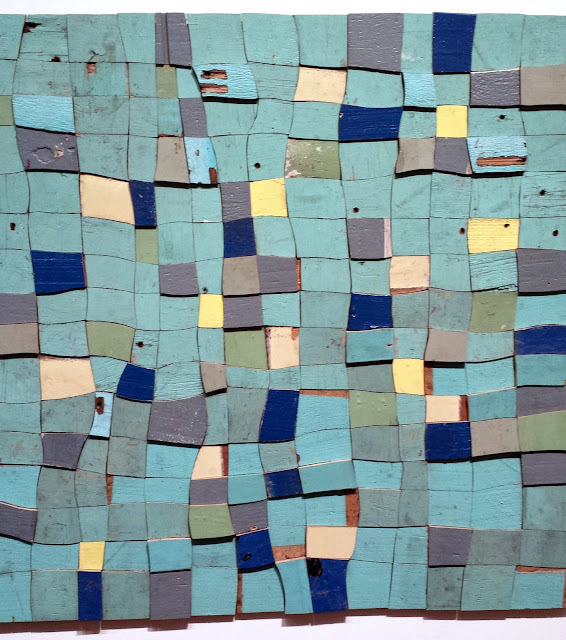 I sewed strips around each square in a log-cabin-like fashion, often piecing scraps together as I went. This kind of sewing is mindless, freeing, and fun - what I love to do! Then, I added strips as needed to make the butterfly prints lay in a circle and make the blocks equal sizes in their rows. There was very little measuring - mostly eye-balling. Again, how I best love to work. This is my favorite block - the teals. The cranes! Those moons! I must really love the quilt recipient! 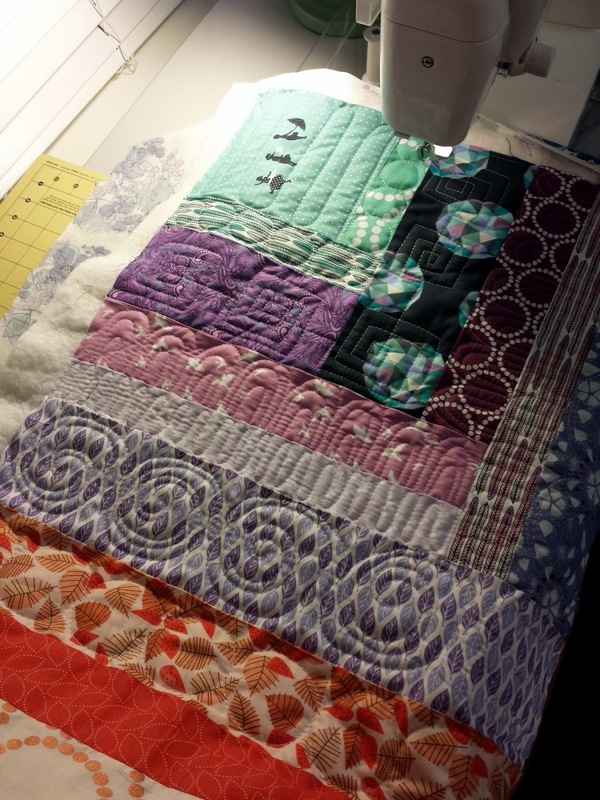 I quilted using my free motion foot only. While many (including myself in the past) use only their walking foot for this motif, I have more control and turn less with my FMQ foot. See more about this on my Spiral Quilting Tutorial. 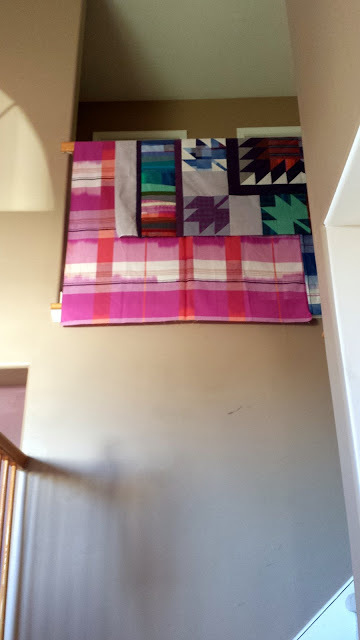 I backed the quilt in a fabric I know she loves (by Valori Wells), surrounded by two panels by Juliana Horner. You can see the quilt label peeking out there. Instead of piecing the label into my backing (which can be a huge pain) or sewing it on afterwards, I appliqued it onto the backing before I quilted. It was easy and it still got quilted over. Score! Whenever I make a quilt for someone specifically, it makes me think about them all the time. I hope the thoughts are felt! This is the first of two quilts (at least, at the moment) that I'm giving this holiday season. You can read and see more about this quilt here and here. 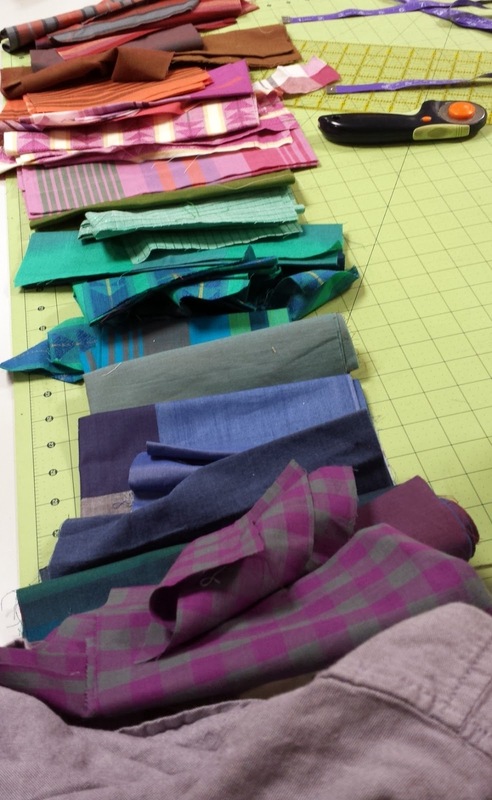 Linking up to Fabric Tuesday @ Quilt Story. 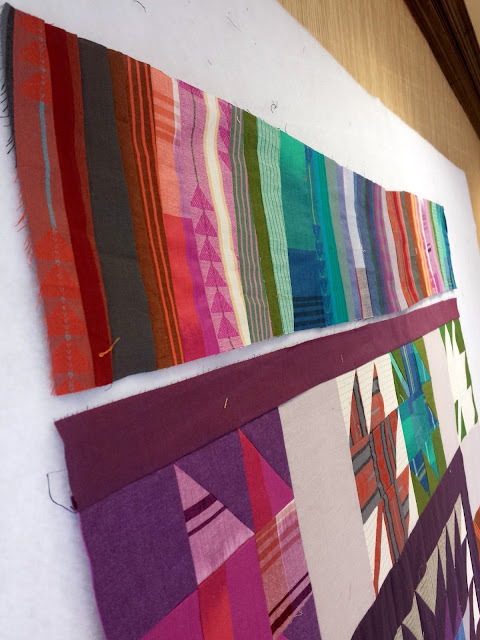 The Loominous quilt is coming along nicely, though it's come to a bit of a standstill at the quilting stage. Aurifil (Dove #2600) threads and all: the sign of a true WIP (work in progress). My husband Mike took a look at the finished top and said "big triangles." 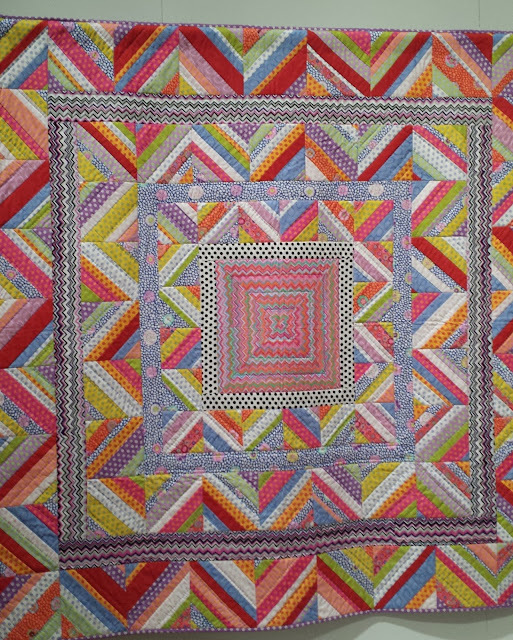 I saw his vision in a different way - triangles (or angles, really) radiating from the center of the quilt. 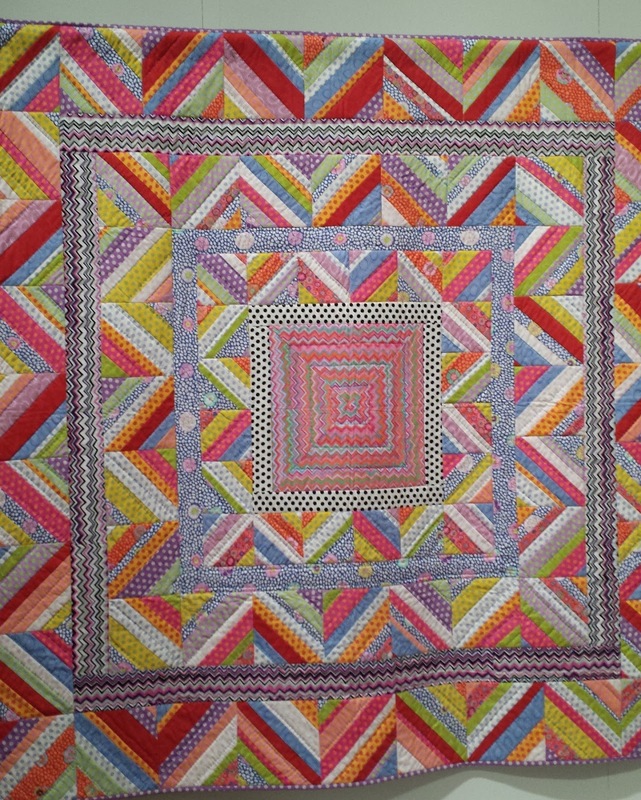 After all, it's a medallion-like quilt, so the middle is the focus. I decided to use my walking foot since it gives me more control over the very thin and flowy woven fabric that is Loominous by Anna Maria Horner + shot cottons. I have a love/hate relationship with straight line quilting, though. On one hand, it doesn't take a lot of effort (except for pushing the quilt through the machine - and for that, I get rewarded with sore shoulders and temporarily buff upper arms). On the other, it's terribly boring, especially when the lines are only a quarter to an inch apart. 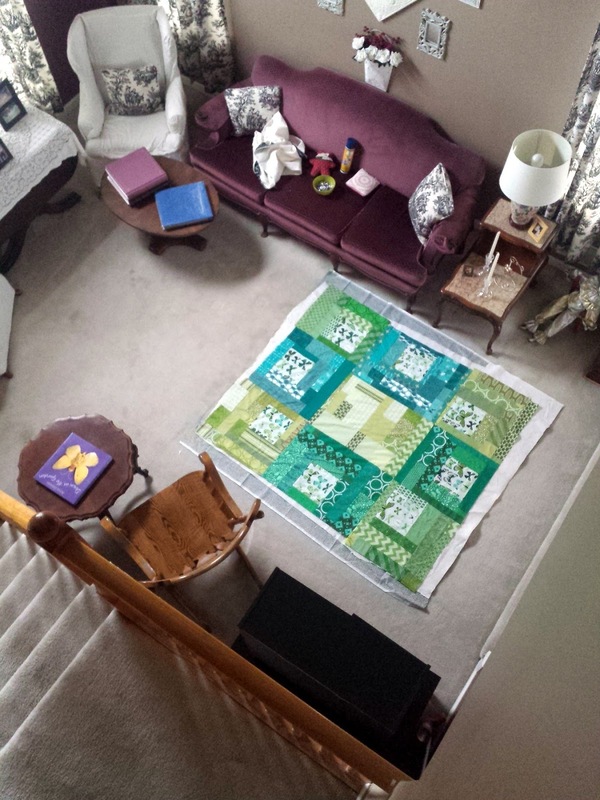 This is a large lap size quilt (47 x 69) so it takes a long time. I've been quilting this on and off for about a week and a half, and about half of it is finished. I don't need to have it done until right before Christmas (it's a gift), but I'm just dying to free motion quilt something instead! Some days I get really inspired to quilt it. Some days I don't want to look at it. And I'm okay with that. Quilting should be fun, always, and I don't force myself. So I work on other projects, too (mostly things I can't share yet). Here is a terribly attractive picture of me trying on the quilt for size at the CJMQG retreat earlier this month. As you can see, it was just a little too short! I'm looking forward to sharing the full quilt next month. In other news, I just played Santa today... someone is getting a quilt soon! P.S. I hope all of my lovely American readers and friends have a very happy Thanksgiving! Spend it with your family and friends and enjoy the moment! I know I will be! 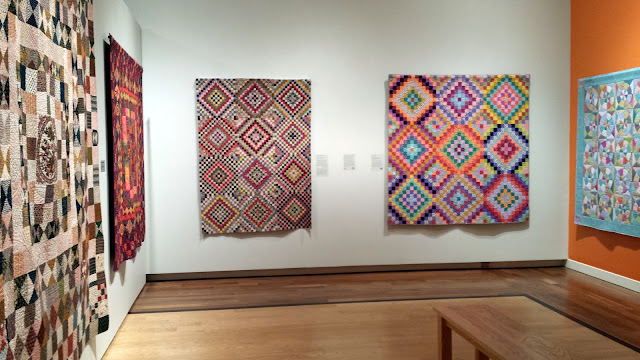 Visit to the Michener Art Museum: "Blanket Statements" by Kaffe Fassett and "Pattern Pieces"
I had the pleasure of visiting the James A. Michener Art Museum in Doylestown, PA today with my mom. We were in the area to drop off a sample at Byrne Sewing Connection (where I'm giving a lecture and workshop in February), and decided to make one big day out of it. The museum is small but mighty and an absolutely lovely place to spend the afternoon (or indeed, several afternoons, as the exhibits change). Plus, Doylestown, PA is a cute, walkable small town with tons of restaurants and shopping. 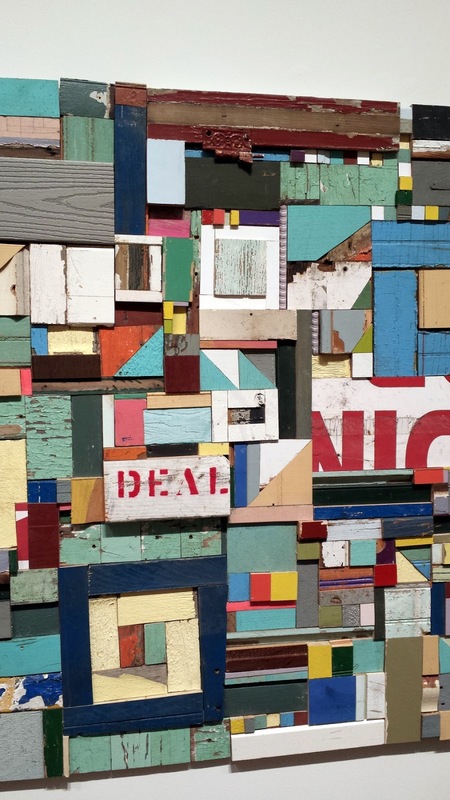 You won't be disappointed if you visit the town, quilt shop, or museum! Promise! Cool, quilty arch inside the museum. I heard about the Michener Museum through my guild. The "Blanket Statements" exhibit by Kaffe Fassett and his team just opened, and several guild members are involved with it (plus, Liza Lucy used to be part of our guild). In fact, some will be doing handwork at the museum in January as part of the museum's welcoming of the exhibit. I saw some of Kaffe's quilts at Lafayette College earlier this year, but this exhibit seemed especially intriguing; he redesigned 15 traditional quilts held by the Quilt Museum and Gallery of York, U.K. Traditional quilt made of satin (if I'm remembering correctly). LOOK! Orange peels! 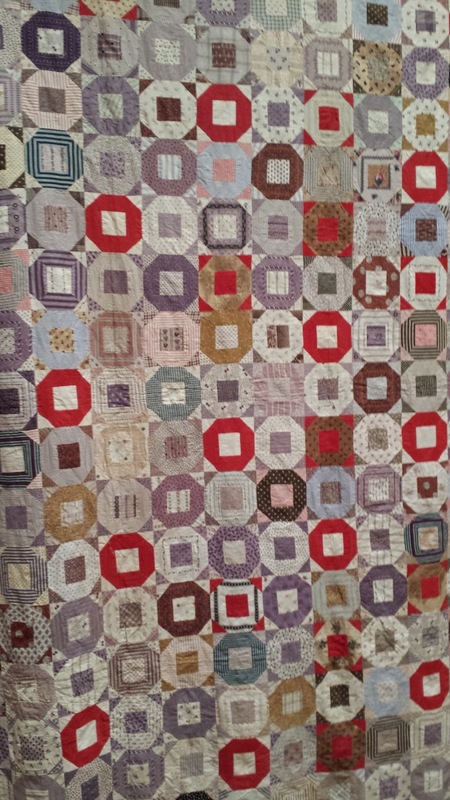 The traditional quilts varied from 1700s to early 1900s - they were masterpieces within themselves. Some were unfinished, and if they were quilted, it was all by hand (as you might imagine!). While Kaffe's quilts retained traditional layouts, his bright, bold, modern colors made the exhibit come alive. I have to admit that I rarely use his fabric (exception: the shot cottons! ), but I do admire his color mastery. 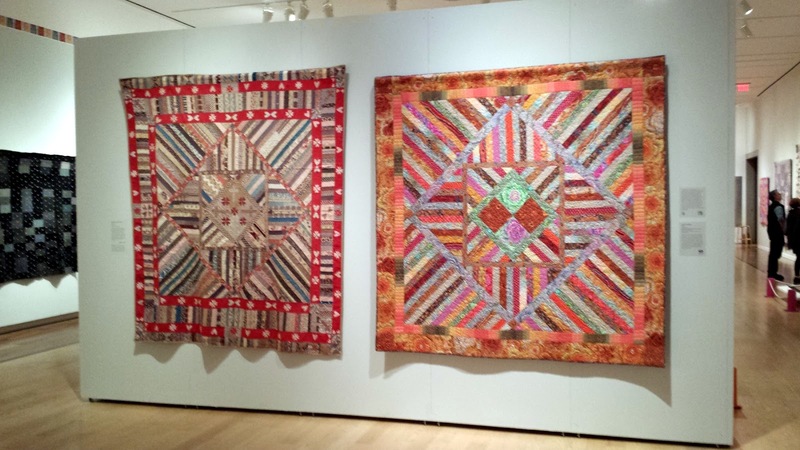 From a quilt design perspective, it was a majestic exhibit to view as a whole. I really enjoyed looking over the traditional quilts (those TINY, HAND-PIECED, SUPER PRECISE wonders) and admiring how Kaffe restructured and modernized them. "The one on the left makes me feel sad, and this one makes me feel happy." "This one looks like a city at night, but this one is daytime." "This one is nighttime and this one is a river." I silently applauded how the educator asked them to explain their answers further and her willingness to give as many of them a turn to talk as they wanted. Dream job much?! 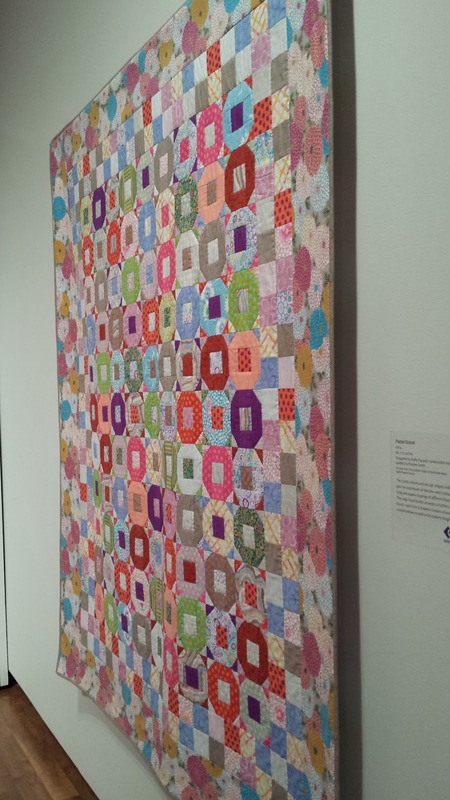 There are 20 quilts made by Kaffe and his team, plus the fifteen traditional quilts. It will be overwhelming - you have been warned! Make sure you see this exhibit if you live in the Pennsylvania area - it's open until February 21, 2016. Do you see the door lock? 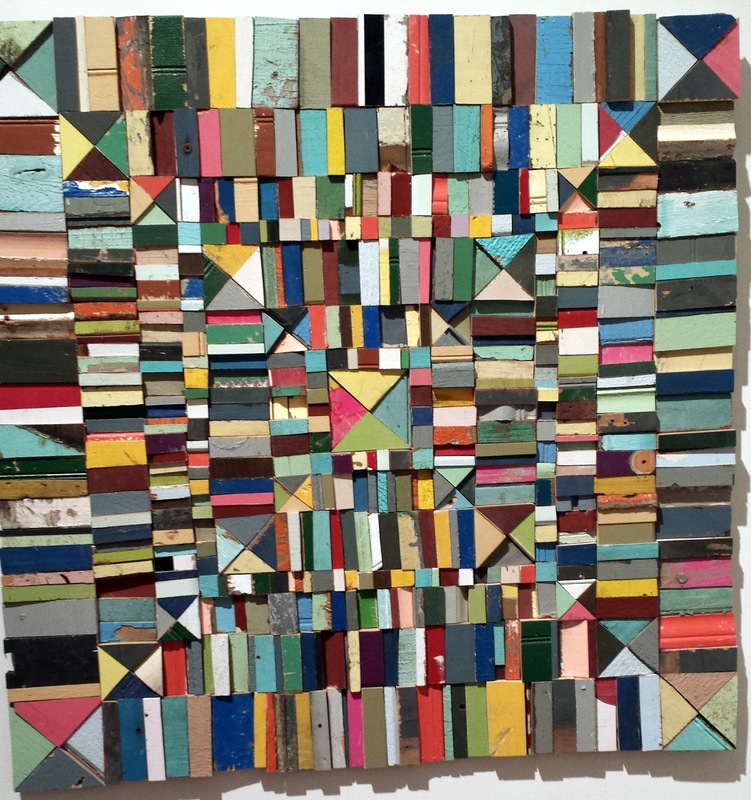 An unexpected delight of this trip was a visit to the nearby exhibit, "Pattern Pieces: Can You Make a Quilt Out of Wood?" Best of all, I found a new artist to follow: Laura Petrovich-Cheney, whose work with salvaged wood from the shores of NJ was the focus of this exhibit. 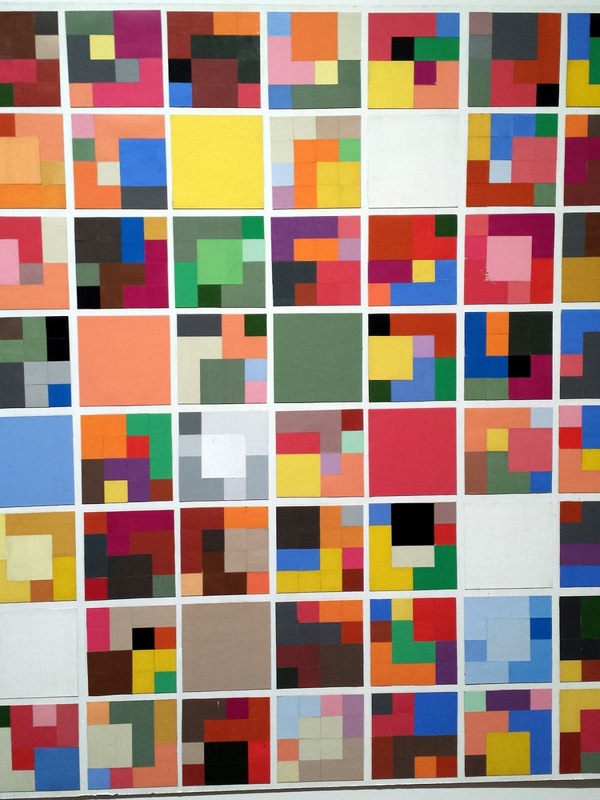 I took pictures of some of my favorites, which reminded me very much of modern quilting and especially of my own improvisational piecing tendencies. All I can say is, wow. You have to go see the exhibit to get the full effect. 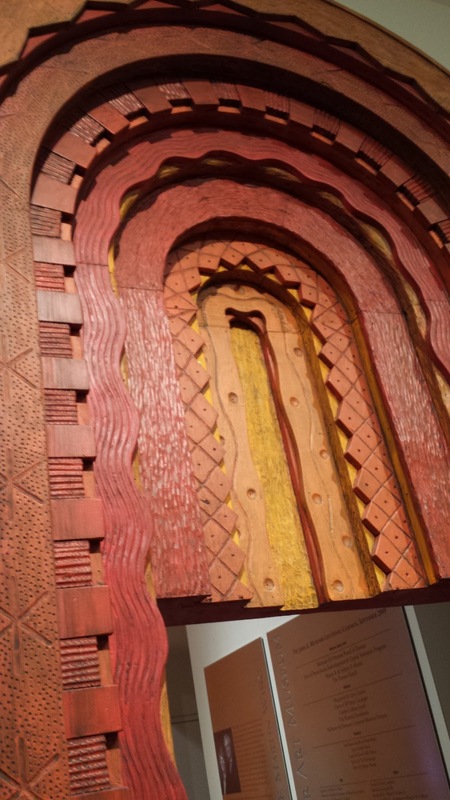 This exhibit runs until January 31, 2016, so hurry up and catch it! Wait until you see how the room is laid out. It's just beautiful. All in all, I came home raring to sew. What an inspirational day. Thank you, Michener Museum! Rainbow Loominous fabric and shot cotton (and one shirt). Basted and ready to quilt. For someone special. Super excited and in love with this quilt again! 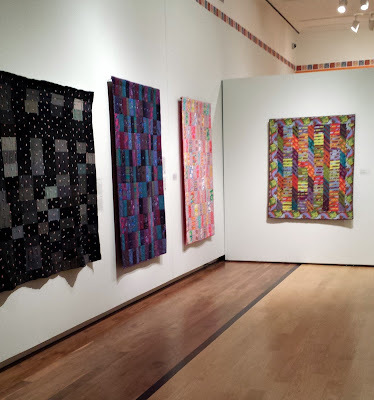 Tomorrow is the start of our annual Central Jersey Modern Quilt Guild Fall Quilt Retreat! About 14 of us (plus day passers) are meeting for three days to sew and hang out in Branchburg, NJ. This was a busy week mainly because our guild meeting was on Tuesday. Before and after the meeting, there are always a lot of emails to go out and work to be done. Now I have to pack for three days away, and I'm bringing a ton of projects! I like to switch constantly during a retreat so I never get frustrated with what I'm sewing. As long as you are driving to a quilt retreat, this is a good idea (I would be limited if I were flying). Last year's retreat (above) was a blast. I was working on my Postcards from Prague voile quilt a year ago, which is crazy (because I use it every day!). I wrote up a blog post for the guild blog if you'd like to read more about last year. I have big plans to get things done this weekend, and take some great photos for QuiltCon submissions! I'll also be teaching a short class on making infinity scarves. You can see all the fun over on Instagram (@quiltyhabit) and on our hashtag (#cjmqg). I'll be back next week! Also, The Wonky Press is scheduled to go out on Sunday even though I'll be away. I hope you enjoy this issue! 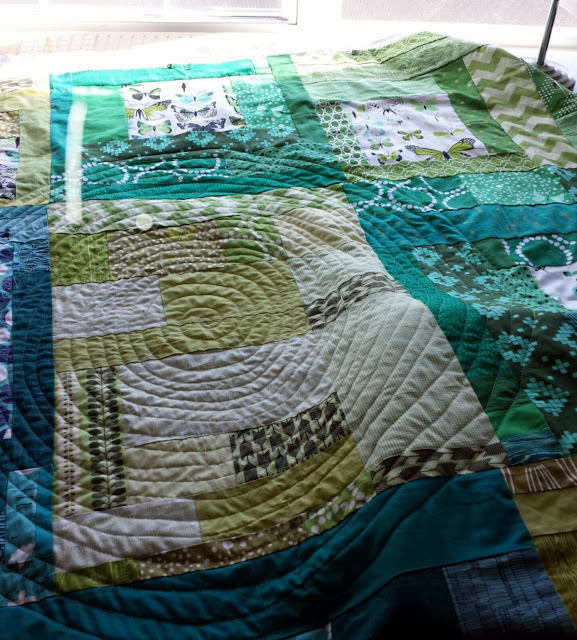 This weekend I completed some crazy spiral quilting on the green scrap quilt. I say "crazy" because it's quite massive for this kind of quilt maneuvering (though not as massive as a queen or king - but it's 56" x 65"). I hopped on Periscope mid-process to discuss some tips and tricks for this kind of quilting, which you can view here if you'd like. I thought it would be helpful to explain them in "hard copy form," too. 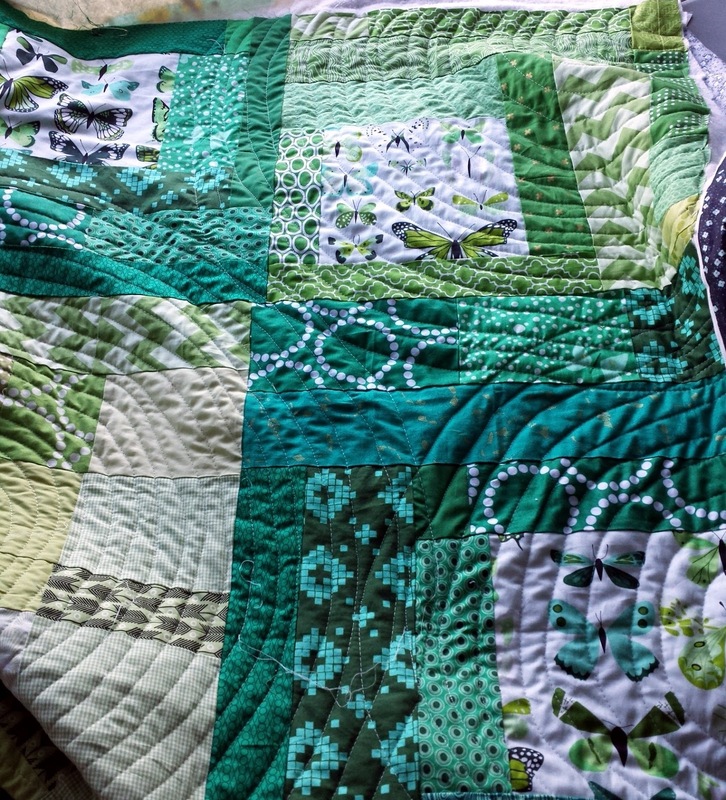 Spiral quilting is a beautiful way to compliment any quilt. In my opinion, it especially resonates on minimalist modern quilts (because you can see so much of the texture) and on scrappy quilts (because the spiral brings all the elements together in a large circle). 1. Pre-wind several bobbins - prevents more stopping later on. This motif uses a ton of thread so be prepared! 2. Try this on a small quilt before you "go big." A mini quilt or baby quilt is perfect (it was much easier to quilt Autumn Wind, which was 40x40, as compared to this green quilt). 3. Have your free motion/darning foot at the ready, and possibly your walking foot (see below for more info). 4. Use an extension table, knee lift, quilting gloves, and Supreme Slider if you can, though you can absolutely do this without these tools. My Janome Memory Craft 6300, which is a professional domestic machine, came with the extension table and knee lift (which will change your life if you've never used it - push it to the right with your knee, and the presser foot goes up - you never have to take your hands off your quilt to lift the pf!). I purchased Machinger's quilting gloves three years ago and I'm still using the same pair. I love my Supreme Slider, which is a teflon sheet that covers the feed dogs for free motion quilting and makes the sewing machine surface much more slippery. All of these things make quilting on a domestic machine much, much easier! You can find any and all of these tools at your local quilt shop or machine dealer. 5. Use two tables. 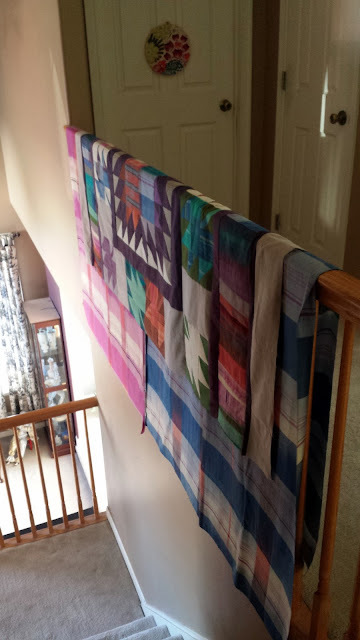 Almost every time I quilt something larger than a baby quilt, I set up a large portable table in front of my normal sewing table. This helps keep the bulk of the quilt elevated and allows me move the quilt with ease. 6. Spray baste your quilt. As I mentioned on my scope on Periscope, people use different kinds of basting methods and there's no right or wrong way, really - whatever works for you. I despise safety pins so I use spray. 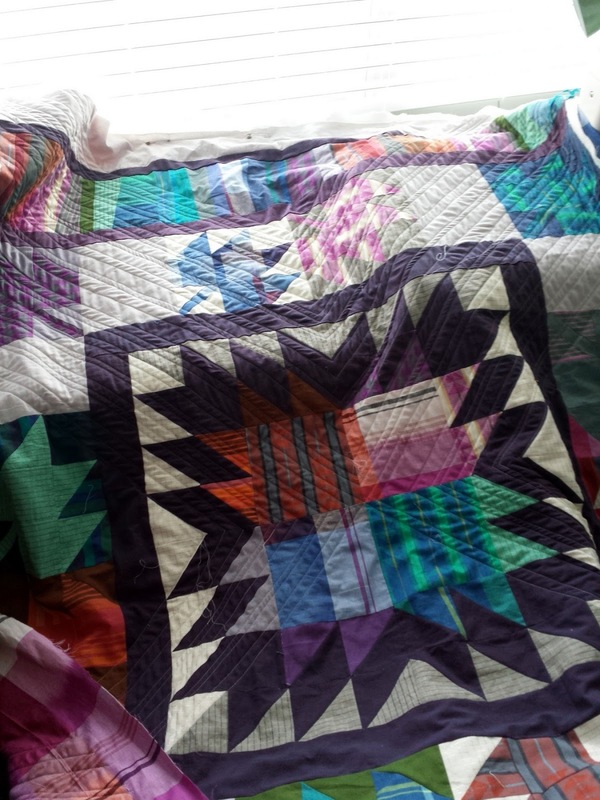 It keeps my quilt together much better than I've ever had otherwise, and it's much quicker. I use the large 10.93 oz. can of 505 spray, which goes a long way! 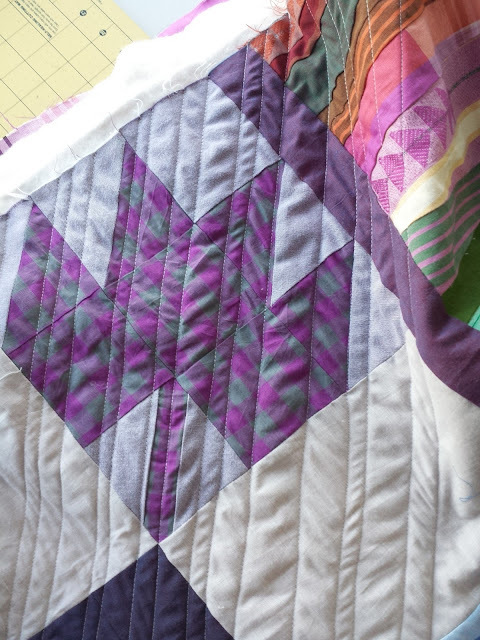 Here's a great tutorial from Film in the Fridge for spray basting your quilts. 7. Decide how far apart your lines will be. If you want them to be equal, you'll want to use a walking foot and guide (or trace all your lines beforehand with disappearing marker, which would take forever!). If you don't mind them being a little off, use free motion the whole way. Some of my spaces were purposefully larger than others. 1. Start in the middle of the quilt. To find the middle, fold your quilt in half top to bottom and mark the middle on the backing with a safety pin. You can take the safety pin out once you are all set up to begin. 2. Use your free motion foot for the first 10 circles or so. Then, it might be easier to use a walking foot. I have done both, and I like using the free motion foot all the way through because I can quilt longer before adjusting my quilt. Plus, I personally feel like I have more control over my FMQ foot. However, the quilting lines are sometimes not as smooth as using a walking foot. You have to experiment and use what's best for you. 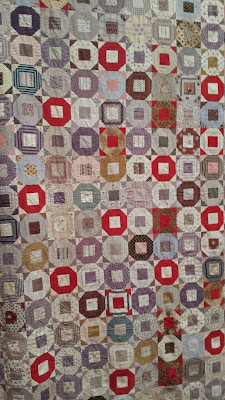 On this quilt, I switched to a walking foot after about 9 circles around. 3. 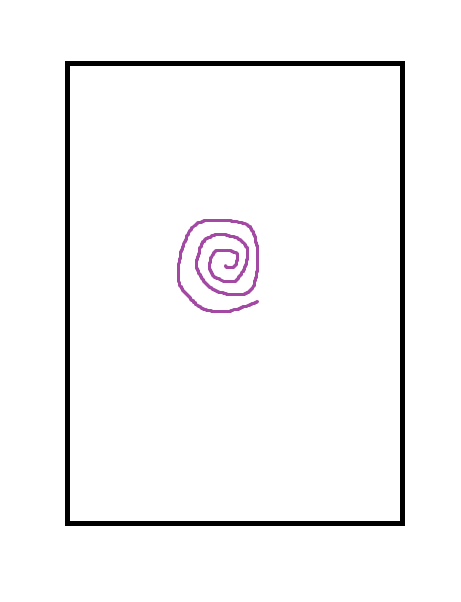 Every 5-8 circles around, check your backing to make sure your fabric didn't fold over on itself. You move your quilt constantly with spiral quilting, so it could happen to even the best basted quilt. If you stop and take the whole quilt off the machine, make sure you stay stitch (or stitch in place 3 or 4 times) to anchor your stitches before cutting the thread. Then you can start quilting again from a few stitches before you stopped. 4. Take breaks and drink a lot of water. Spiral quilting a large quilt is not for the faint-hearted (you'll likely have sore arms and shoulders), but it truly is a gorgeous quilting motif. 5. 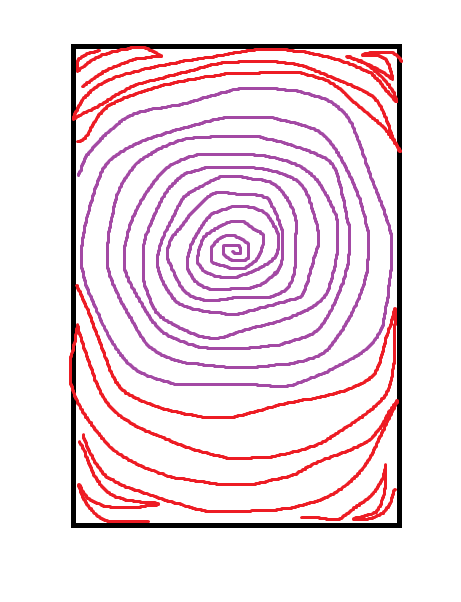 Many quilts are rectangle, so once you've quilted all the way out in a circle, you'll have to go back and fill in the top, bottom, and four corners of your quilt (see above in red). 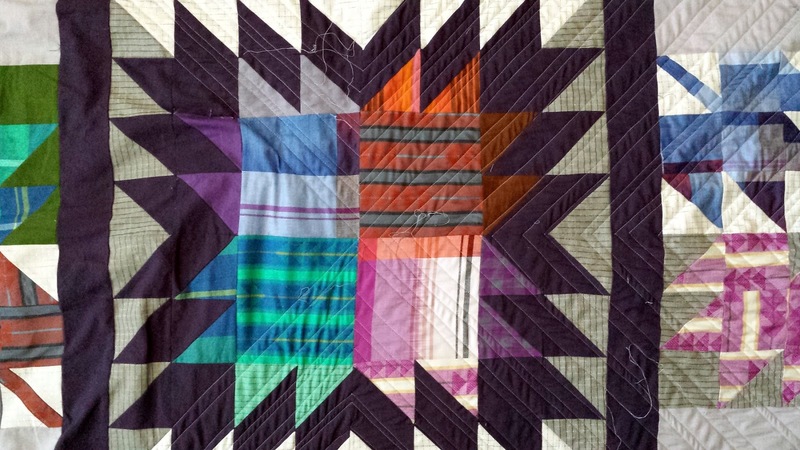 This part is much easier because you don't have to move the whole quilt in a circle! 6. Have fun! Spiral quilting can also therapeutic - I can attest to that! 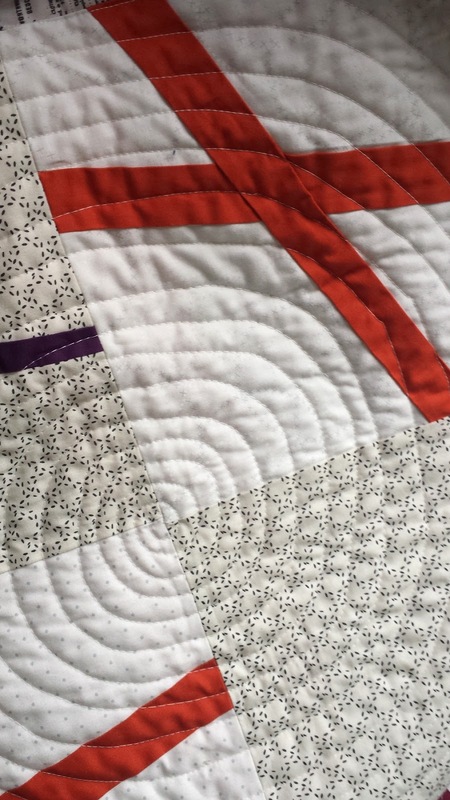 Halfway through writing this post, I happened across 10 Tips for Spiral Quilting over at Flourishing Palms. 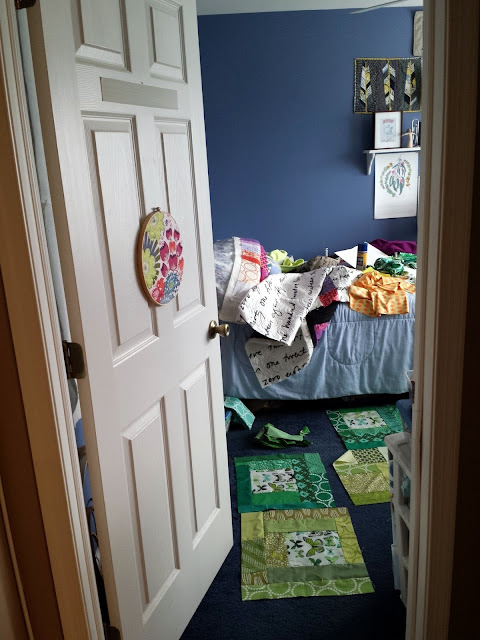 Linda showcases the walking foot in a very detailed and helpful manner, so before you start quilting, I suggest you check out her post, too! With my free motion foot only, I quilted this quilt with several spirals radiating from different sides. It's an experiment that went swimmingly well. 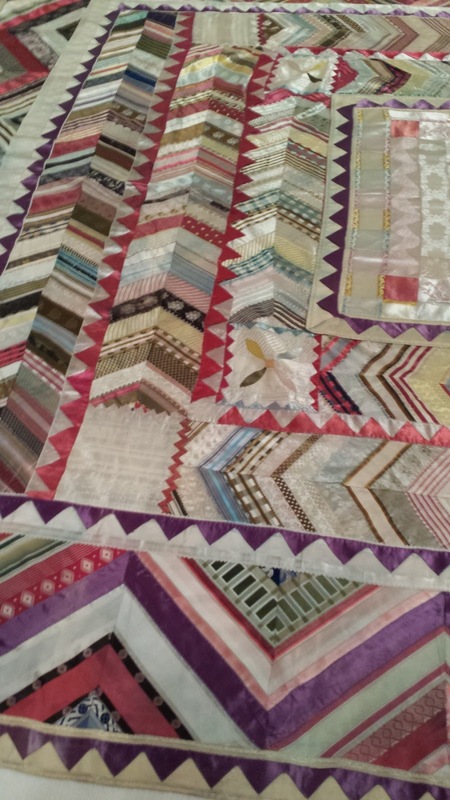 More about that when I share the finished quilt! As I begin to type Issue 4, I want to thank everyone for all of their support of my brand spankin' new newsletter, The Wonky Press. The first issue went out on October 1, and there have been three so far (it always comes out on the 1st and 15th of the month). I've had some amazing feedback so far and I love how our community is getting involved! I strive to make each issue original and full of content I've never published (and never will publish) here on the blog. Plus, I create a visual theme each time. It's really stretching my writing and designing skills! Here is a link to past issues of The Wonky Press. You can read more about the newsletter there and also subscribe (or see the bottom of this post). This link will always be available on my right sidebar when you click the logo shown above. If you have a suggestion for a topic in the "What's Up in Modern Quilting" section or any suggestions at all, I'd love to hear them. I want to make this newsletter relevant to you! Email me at quiltyhabit (at) gmail (dot) com. Topics so far have been Improvisation and Swap Culture. Don't forget to send in your submissions for The Sewing Circle from Issue 3! Here's a sneak peek at Issue 4: an interview with a modern quilter I love, a list of favorite sewing bloggers, and a bit about blogging in the sewing world today! Here's some quilting I've been doing this weekend. Because blog posts need pictures! I love writing and designing this newsletter, and I hope to continue for a long while! Fun fact: I took a desktop publishing class in high school and seriously considered it as a career for a while (but my love of teaching won out). Thanks again to everyone for their encouragement and participation! 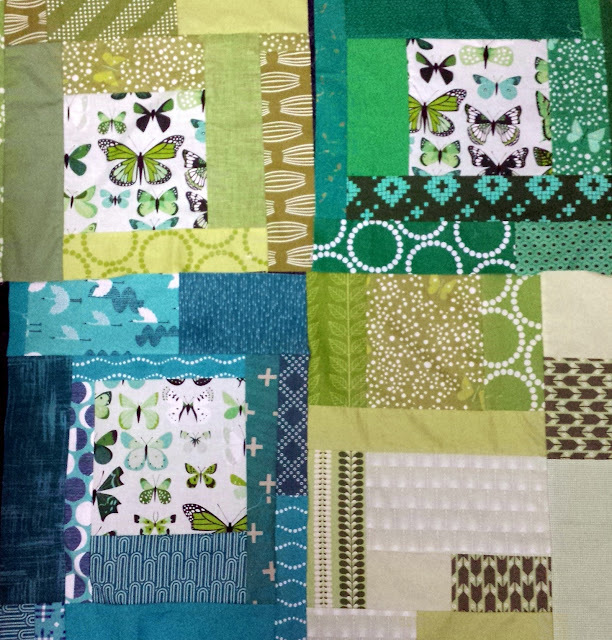 Scrap piecing is good for the soul.